One of the most widely chosen materials for boat building projects is plywood. It is easy to work with, it is relatively inexpensive, and many kits and plans are specifically designed for plywood construction. Often times a fiberglass skin is laminated over the outside of the hull, primarily to provide some abrasion resistance, but also to add a measure of stiffness, because we all know stiffer is faster! And herein lies the downside: Fiberglass and epoxy add weight to the boat. How does one resolve this contradiction of strength versus weight? Under the watchful eye of Bill Bertelsen (Project Engineer), the tech staff utilized our Hydromat test apparatus to gather fundamental stiffness information on 2′ x 2′ plywood panels. 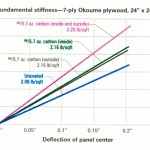 We tested commercially available 3/4″ seven-ply Lauan and Okoume plywood. First, the uncoated panels were weighed and measured for stiffness. Next, a single layer of 6 oz. 0-90° fiberglass cloth was applied to one side of the Lauan panel using WEST SYSTEM® 105/206, and a single layer of 5.7 oz. 0-90° carbon cloth was applied to one side of the Okoume panel also using 105/206. The weight of each panel was taken again. The fundamental stiffness of each panel was recorded in two configurations. First, with the fiber reinforcement in compression, as if it were on the outside of the hull, and then with the fibers in tension, as if it were on the inside of the hull. Finally, another single layer of each cloth was applied to the other side of each plywood panel as before, the weights were taken, and the panels were tested for fundamental stiffness. The stiffness of a panel is determined by measuring the amount of panel deflection at the center of the panel vs. the amount of contact (or hydrostatic) pressure within the water filled bladder of the Hydromat that is required to deflect the panel a given distance. The greater the contact pressures the stiffer the panel. Imagine how a hull section would flex when slamming into waves as the water presses in on the unsupported spans between bulkheads or stringers. These areas are where stiffness counts. 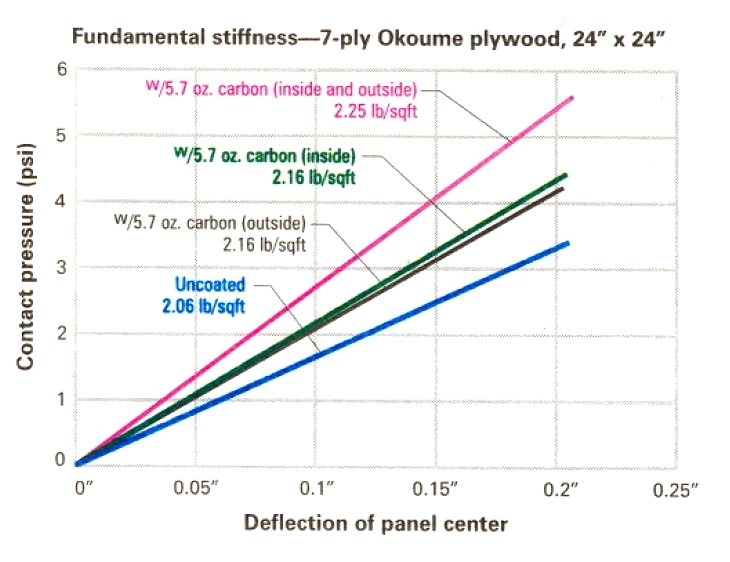 The graphs below depict the increase in stiffness measured as the panels were reinforced as described above. 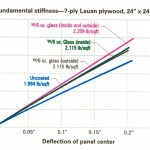 The basic stiffness of the Lauan panel was 9% more than the Okoume panel. Both graphs show that each panel was slightly stiffer if, when only one side was reinforced, the fibers were placed in tension as if on the inside of the hull. The Lauan with one side glass reinforced improved stiffness by 18% and 23% (depending on fiber orientation) with a 7% increase in weight. With both sides reinforced, stiffness increased by 32% with a total weight gain of only 11%. Not a bad trade off. The Okoume reinforced with carbon fiber performed even better. When one side was reinforced, stiffness increased by 28% and 34% (depending on fiber orientation) with a corresponding weight increase of only 5%. When both sides were reinforced stiffness increased an impressive 66% with a total weight increase of 11%! This is a very good trade off. Of course, carbon costs more than fiberglass, so depending on the application and intended use, the cost of materials may become significant. But, from an engineering viewpoint, we hope this data helps our readers to make more informed decisions when building with plywood.